Ketchup Eusebio also expresses his thoughts on playing supporting roles over the years. Fans have seen seasoned actor Ketchup Eusebio play sidekick roles in film and on television over the years. But even though he still continues to portray supporting roles up to this day, he did not stop himself from pursuing his passion. 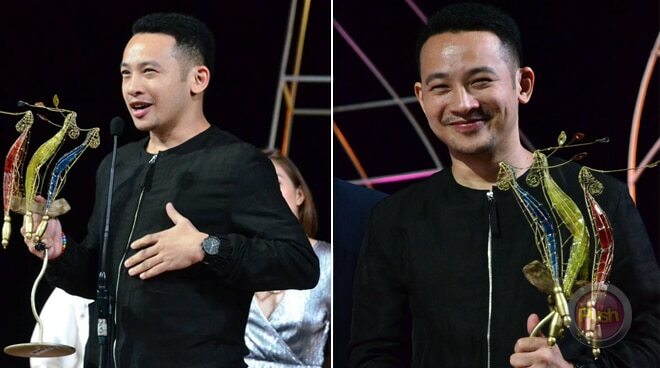 True enough, his devotion to his craft paid off as his role in the film Mamang at this year's Cinemalaya Independent Film Festival won him the Best Supporting Actor Award. "Lampas langit na pasalamat. Lubos-lubos na nag-uumapaw na thank you sa lahat ng mga nakaka-recognize dun sa pinaghihirapan natin especially sa Cinemalaya. So it's my first award from Cinemalaya," he said in an interview after the closing ceremony of Cinemalaya Film Festival 2018. Ketchup expressed how he feels that he finally gets to make a mark in the industry. "At some point, an actor has to take control of his career. You have to take a risk for the results so it includes choosing the right roles, the right timing, who to participate with, stick with the people that you trust. So I'm just really blessed na nagkakaroon ako ng chances na maka-work 'yung mga magagaling na tao na hinahangaan ko, na pinagkakatiwalaan ako," he stated. The 32-year-old actor said that he doesn't really care whether the role he's playing is the lead or not. "Wala siyang distinction kung supporting siya or lead siya or muchacho or ensemble lang na kagaya ng ginagawa ko sa Teatro. Kung ano 'yung naglalaro ng interes ko, dun ako. So kahit anong klaseng role, basta kung ano 'yung tumama saken," he explained.